The squid has nothing to brag about when it comes to looks, especially since has been the antagonist in many a monster movie. As ugly as it may be to gaze upon, this sea creature brings a delightful touch of the ocean to your dishes at an affordable price. There are many ways to cook squid. It is tasty on the grill, fried, stuffed, or slow-cooked. Cooking squid is finicky and requires care and attention. It is very time-sensitive and the entire texture of the seafood can be ruined in a matter of minutes. Fresh squid is available in most major supermarkets that have a seafood counter. Fresh squid should look shiny and smooth and have a mild smell of the sea. If it looks dull or wrinkled or smells very fishy, it is not fresh and should be avoided. Both whole squid and cut squid are often available frozen in grocery stores as well. Frozen is a good option if your store does not have fresh squid available. Pay attention to the size of the squid you are buying and how they relate to the portions you need. Some of the following tips provide helpful guidance on how to make the appropriate amount of food when you are cooking squid. Squid and calamari are two different animals. Squid you find in the grocery store is often Nototodarus gouldi while calamari comes from the genus Sepioteuthis. Often times, squid costs less and is tougher meat and calamari is more tender and expensive. An easy way to identify the difference is by the fins. On a squid, the fins form an arrow shape and a calamari's fins extend much longer than a squid's fin. Squid must be cooked for either a very short time or a very long time. Anything in between turns it very rubbery. Two minutes over high heat is plenty. Beyond that will require at least 30 minutes to an hour to re-tenderize it. 12 ounces whole squid or calamari or 6 ounces cleaned = 1 standard serving. One 6-inch squid weighs about 4 ounces. Measure the body, excluding the tentacles, and make 5 inches or less your goal for quick-cooking methods and larger for long-cooked. Those pieces weighing less than 10 ounces are the most desirable for tenderness. If you are looking to harvest the ink, you'll want squid longer than 5 inches. 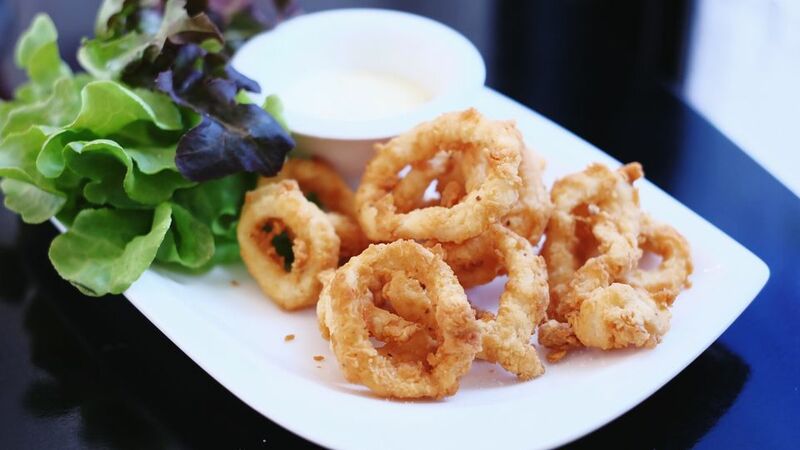 When purchasing uncleaned squid or calamari to use in a recipe that specifies cleaned squid, you will need approximately 25 to 50 percent more. Up to half of the body weight can be discarded during cleaning. For squid that is cooked quickly, plan on 1/4 to 1/2 pound per person. For long-cooked dishes, count on at least 1/2 pound per person to allow for shrinkage during the cooking process. For a different take on a quick cooking method, parboil the squid by dropping it into rapidly boiling water for no more than one minute. Plunge into ice water to stop cooking. Drain well, cut as desired, and marinate in your favorite dressing. Conch or abalone can be substituted for squid in most recipes. The flavor and texture are very similar.